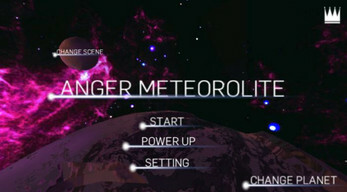 Anger Meteorolite is about different planets that a meteor has to destroy. When you open the game, you can see the menu in which you can perform different actions, that are Start, Power up, Setting and Change skin. The Power up button allows you to activate and level up the power ups, in Setting you can turn on or off the sound of the game and change the camera height, choosing between far, medium or close. The camera follows the falling meteor and when it collides the camera moves away from the ground to show the buildings disappearing as they are destroyed. Then the Change skin button allows you to change the look of the meteor picking between the six different types of skin. The types of skin are the normal meteor, a basketball ball, an orange, a billiards ball, the Sun and a diamond. Finally, the Start button send you to the scene in which you can choose the planet. There is a total of three planets and, when you touch one, it appears bigger on the screen. 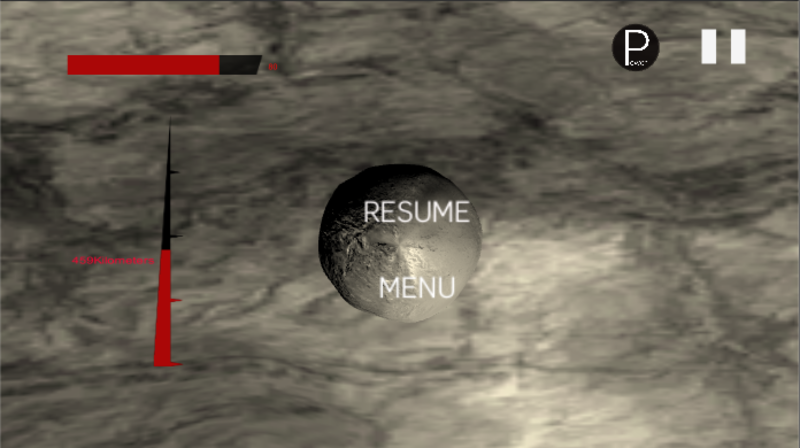 Then, you can rotate it to see the different areas and choose one of them. 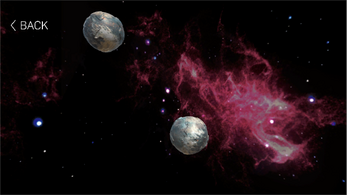 Every planet has different areas that vary from the easiest level, that is the white one, then the medium level, the orange one, the difficult level, the purple one and finally the extreme level, the blue one. 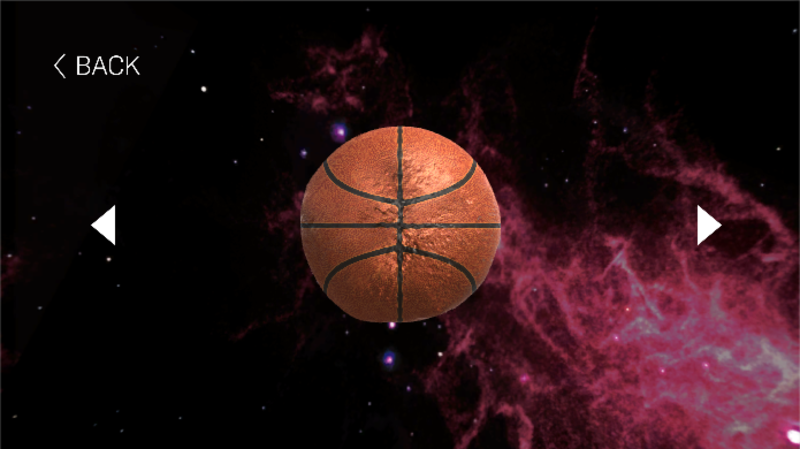 After choosing the area, the meteor will go rotating towards the ground to demolish the buildings on the planet. Each planet has different kinds of buildings. First, the Human civilization planet comprehend four types of buildings and each type make you gain 1000, 1500, 2000 or 2500 coins. Then, the Stone age planet and the Magic world planet have three types of buildings each, which give 2000, 2500 or 3000 coins. Various attacks try to destroy the meteor in order to cut its power down and each planet has different types of attacks. In the Human civilization planet, the attacks are missiles, lasers, that take respectively 10 and 20 points off the power bar, and slow lights that slow down the meteor during three seconds. Then, in the Stone age planet we have arrows, axes and stones, that take respectively 20, 25 and 35 points off the power bar. Finally, in the Magic world planet we have swords, ice rocks and trishulas, that take respectively 15, 20 and 30 points off the power bar. The power the meteor has can be seen in the red bar on the upper left side of the screen and it goes from a hundred to zero. The power determines the number of buildings that the meteor can destroy, and the coins you receive accordingly. The coins can be used to activate power ups for the meteor. There are three types of power up, and each one has various levels. The more coins you have the more levels you can unlock, and every time you level up the power up becomes a bit stronger. The power ups are Shield, Weight and Invincible. The first one gives the meteor a shield for each level you unlock, as said for level one it gives a shield, for level two it gives two shields and so on. Then the second one adds twenty points of power for each level, so that the first level will add twenty points, the second level forty and so on. Finally, the last one neutralizes the attacks during 0,5 seconds for each level, so that the planet will not be damaged for 0,5 seconds in the first level, 1 seconds in the second level and so on. Moreover, when the Invincible power up is active a shaded layer appears around the meteor. Power ups must be activated in the menu. To activate the power ups, you need one million coins for each one and to level up you have to pay two million for the second level, three million for the third level and so on for each power up. When playing, you can also see a vertical red bar on the left side of the screen. It shows the kilometers left for the meteor to reach the planet. The collision of the meteor with the ground produce an explosion and a counter of points appears. For each destroyed building you can see the points summing up in the counter. 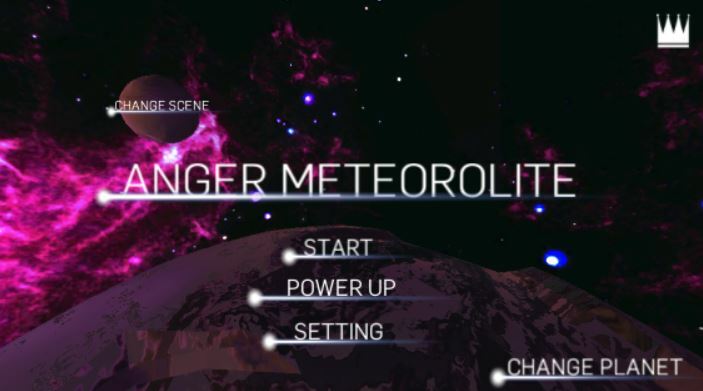 If the meteor loses all the power because of the attacks before reaching the ground, the game will stop and the Battle terminated scene will appear on the screen, showing that you have not gained any coin. On the contrary, if the meteor destroys all or some of the buildings, the Battle terminated scene will show the number of coins you gain. In this scene, other than the number of coins, you can see the Restart button, that allows you to play the level again, and the Back to menu button, that send you to the main menu. 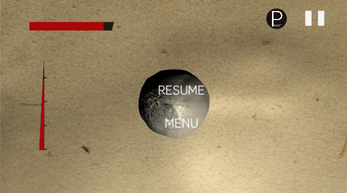 While you are playing, two more buttons can be seen on the upper right side of the screen. If you touch the Power up button, a window that shows you the power ups you have activated opens, but if you don't have any, the button doesn't respond. You have to touch the power ups to activate them and as you do so they will disappear from the window. The other button is the Pause one, that allows you to pause the game and to resume it or go back to the menu.